Well, the latest outrage to hit the comics community is the "death" of the Human Torch, Johnny Storm. In the latest issue (No. 587) of the Fantastic Four, out today, Johnny Storm, the Human Torch, heroically dies in battle. Death is natural. Death is normal. Given the extraordinary dangers these characters face on a monthly basis, it would be unrealistic for some of them not to die. 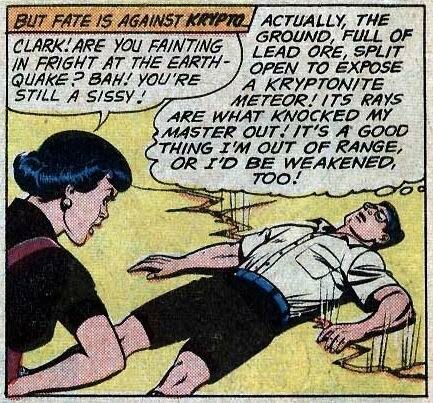 One of the reasons superhero stories can be so dramatic is that the writers can take the characters right up to the brink of death. It would be unnatural for some of the heroes not to topple off the cliff. Even though you know this death will not be permanent (superheroes almost always return), this is quite the event since the character has been around for 50 years. 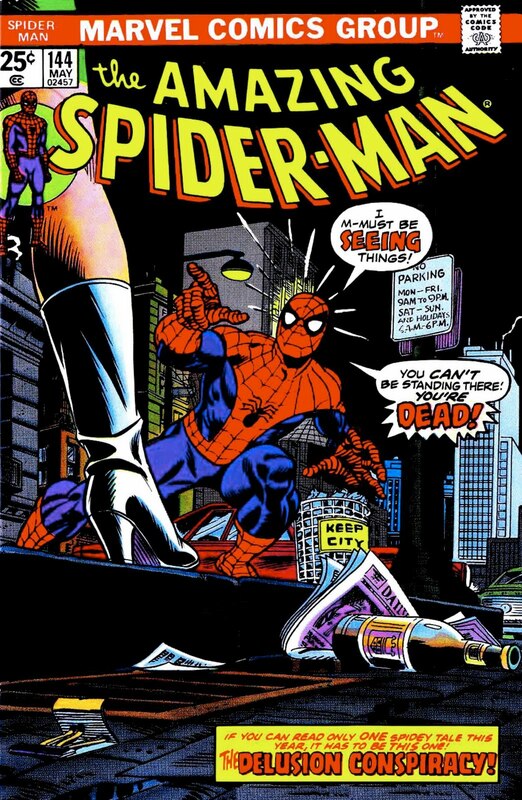 If it's unrealistic for comic characters to keep dodging the bullet, how much more unrealistic is it for them to stop the bullet but then be revived? We all know someone who's passed away and been buried; how many of us have later encountered them on the street? 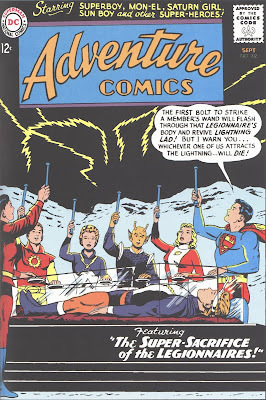 Don't get me wrong; I loved the Lightning Lad story when I first read it. I also was fascinated by the (brief) return of Gwen. But what works once or twice rapidly becomes cliched. Death and resurrection breeds cynicism. And cynicism is Kryptonite to fantasy. 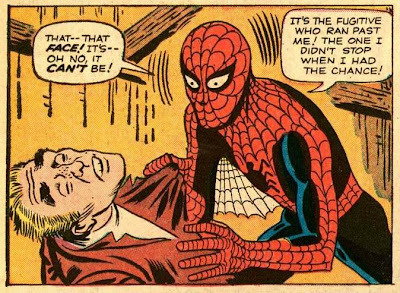 I consider Spiderman the single best Silver Age character. 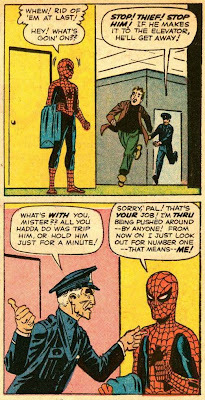 For starters, he has the best motivation for putting on the outfit and fighting crime: Because when he failed to stop a criminal, it resulted in the death of his uncle Ben. That is a simple, direct and personal motivation. 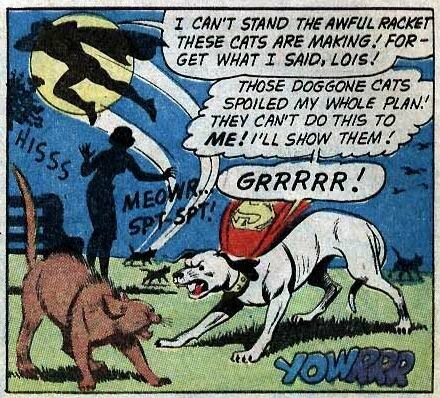 Second, of all the Silver Age superheroes, he has the best-realized secret identity. As I have mentioned before, all of the superheroes have a pretty strong cast of supporting characters when wearing the mask and tights. 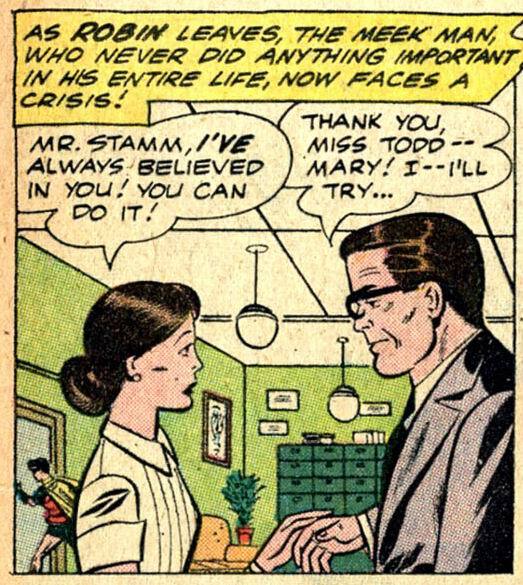 But only Peter Parker seems to have much of a life outside the spandex. Think about all the characters that Peter interacts with. He has Aunt May at home. 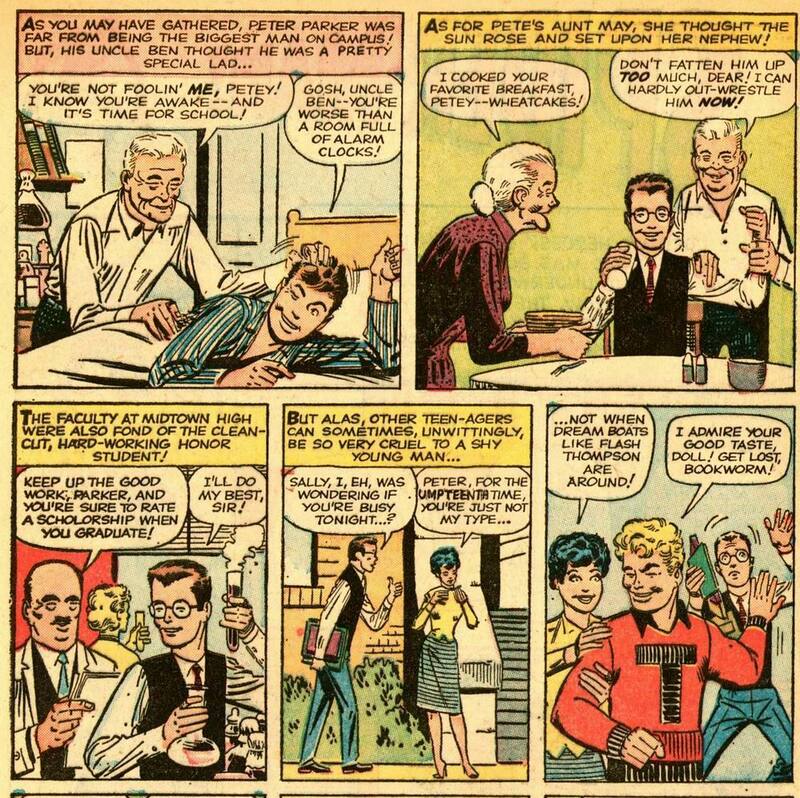 He's got (initially) Flash Thompson and Liz Allen at school; after graduation that expands with the addition of Gwen and Harry. 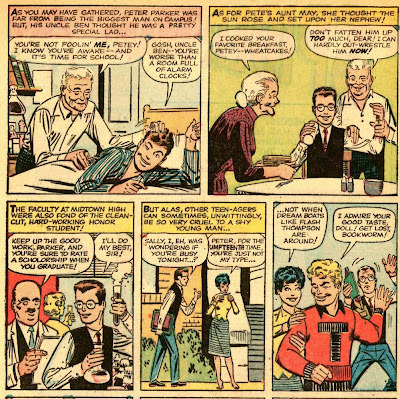 He's got J. Jonah Jameson, Betty Brant, Joe Robertson and Fred Foswell at the Daily Bugle where he works. And most of those characters have supporting actors of their own. There are even people that we hardly notice in the Silver Age: Professor Warren and Doctor Bramwell, for instance. 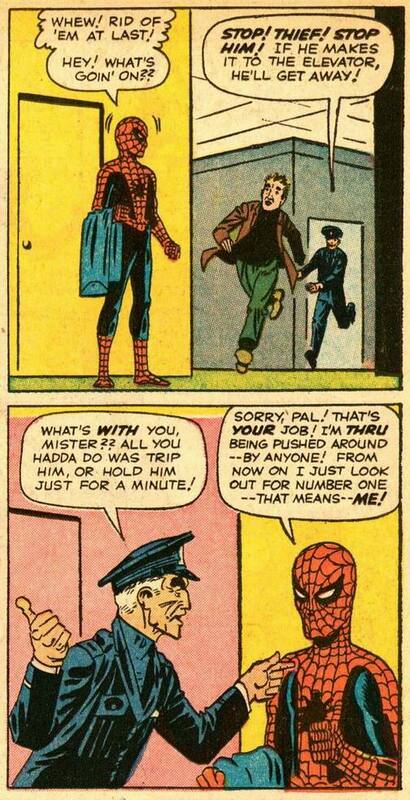 So I thought I would go through the Silver Age Spiderman in a bit more detail than I have in the past. The book he debuted in, Amazing Fantasy, had debuted as Amazing Adventures, then switched to Amazing Adult Fantasy with the seventh issue. For this finale to the series, the word "Adult" had been dropped. 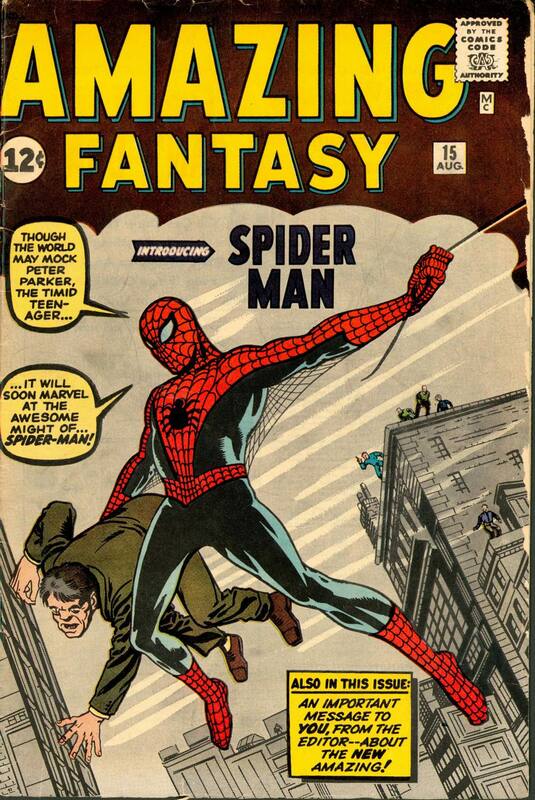 The story closes with an exhortation to buy the next issue of Amazing Fantasy for the further adventures of Spiderman. Of course, that next issue never arrived, and it was not until seven months later that ASM #1 hit the newsstands. Comments: An argument can be made that aside from the compelling motivation, there is not that much new about Spiderman in this introductory story. 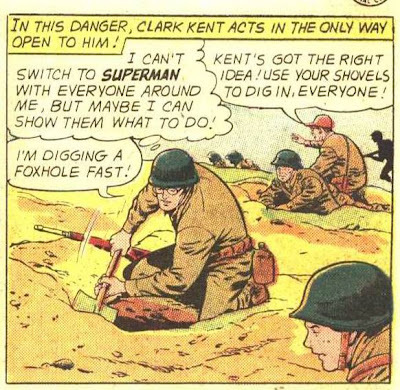 Clark (Superboy) Kent had some troubles fitting in with his classmates, although it was never a continuing theme, just an occasionally recurring one. But look a little harder and you'll realize that there is a great deal of novelty in this story. 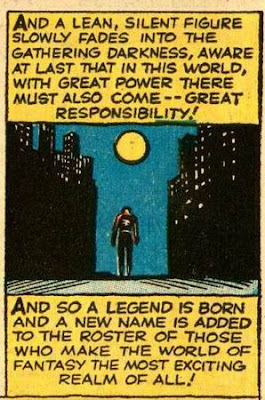 Was there ever a superhero before this whose reaction to his powers was the quite natural, "How can I make a buck off this?" 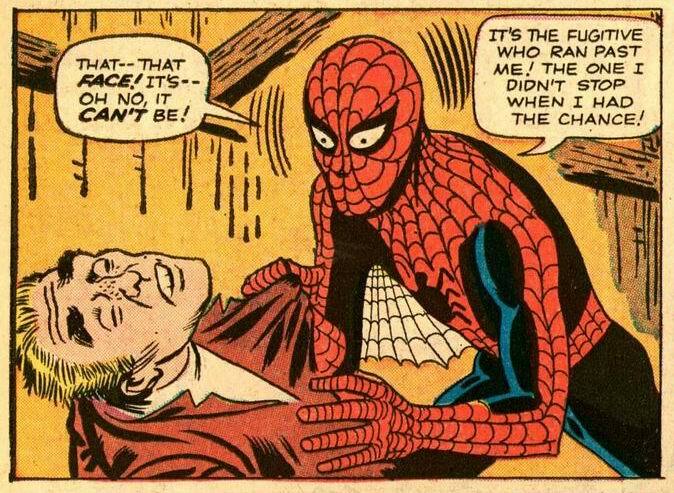 Was there ever one who had a continuing antagonist like Flash Thompson, who was not a villain per se, just a bully? A very solid introduction to the series. Is May the Cruelest Month? 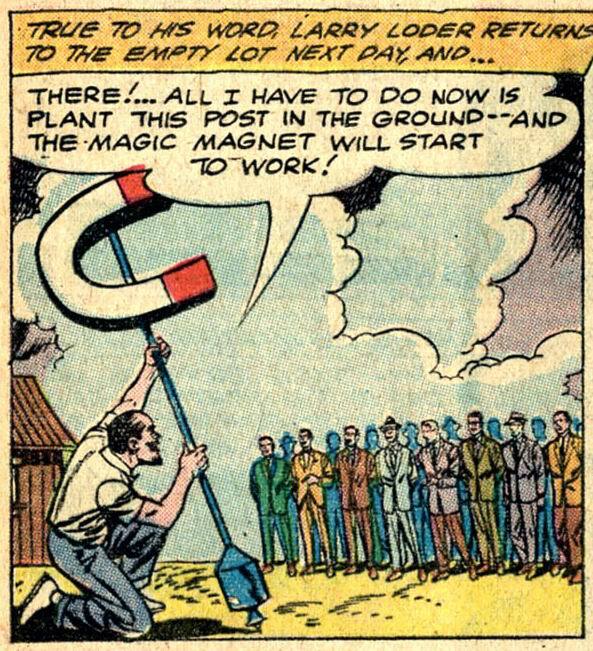 I have often commented that DC released 30 comics a month, regular as clockwork, during the Silver Age. I based this on the fact that DC released about 3500 comics in the 1950s and about 3600 comics in the 1960s; simple math gave me the rest. But it occurred to me last night that perhaps the distribution pattern was slightly different than I imagined. Wasn't it more likely that DC ramped up production a bit during the summer months, when kids had more free time? So I decided to do a little research into the matter. For reference, I used the Master List of DC comics compiled by Mike Voiles at Mike's Amazing World of DC Comics. It turns out that 30 comics a month is a good rule of thumb. From 1955-1970, the fewest number of comics released by DC in a month was 25 in May 1961, while the greatest number was 39 in August 1958. 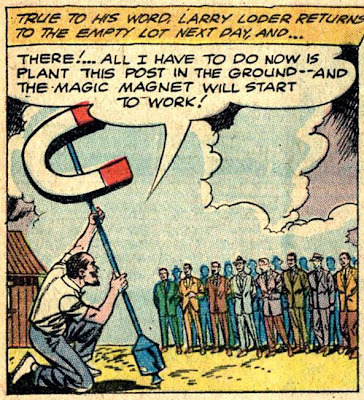 But the vast majority of months the number of comics released ranged between 27 and 33. Note the oddball month of February in there; February consistently had more comics released than March, even though most years February had 28 days in it compared to 31 for March. If forced to speculate I'd note that back in those days, both Washington and Lincoln's Birthdays were holidays in most of the country, meaning kids had more time off school in February than in March. Why the jump in April? Spring break is my guess. 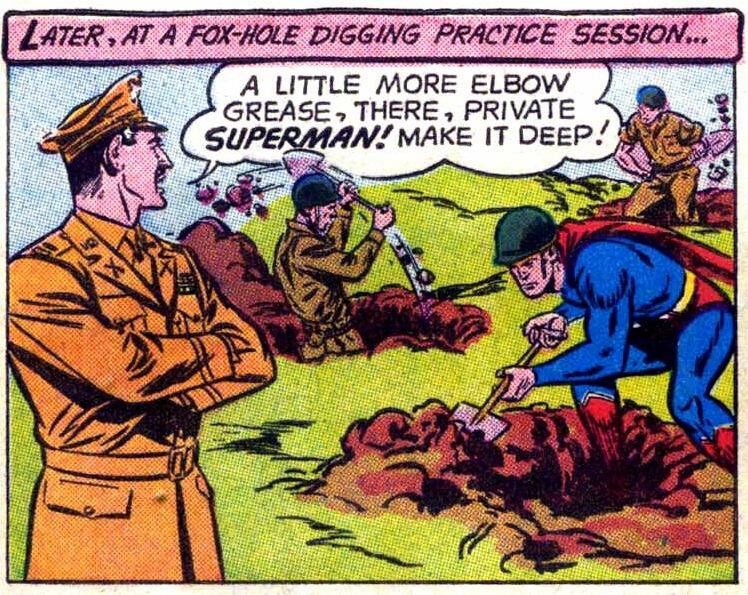 But I've been trying to find one Superman story in particular, based only on a vague recollection of its plot and a very vivid image of a single illustrated frame. I'm wondering if what I remember might call to mind any particular issues. In the story, the Man of Steel is powerless and on another world (probably one with a red sun, but I can't really remember). In the frame I recall so vividly, he takes of the top of his uniform and washes it in a stream, noticing as he does that the colors run in the rushing water. Figure late 1950s to late 1960s for the timeframe. The part about Superman taking off his shirt made me think of Superman #164, which features Superman and Luthor bare-chested on the cover slugging it out in the ring on the red sun world of Lexor. 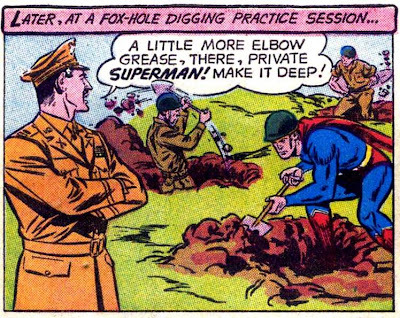 But Superman's colors don't run in that issue, nor do they in the major Lexor stories in Superman #168, and Action #s 318, 319, 332, 333 or 335. 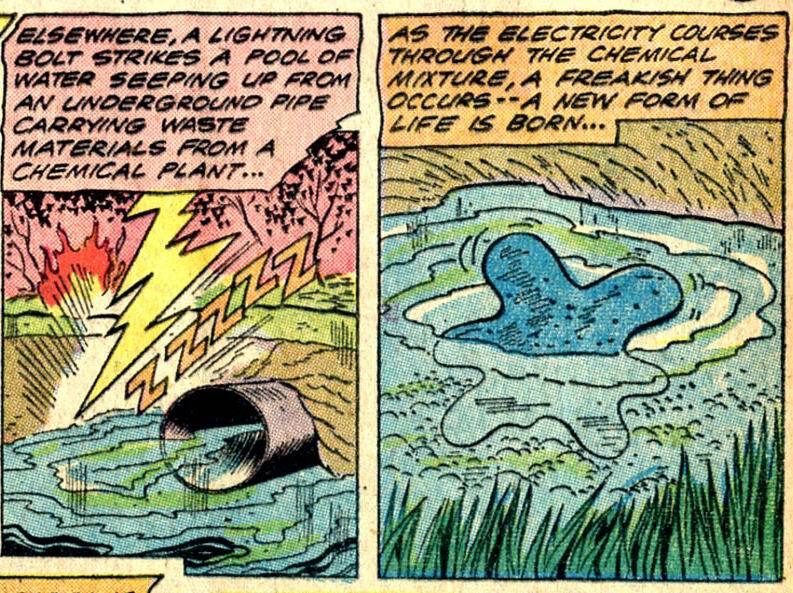 I also checked Superman #184 and Action #370 after Jason mentioned that the story featured a pre-modern society element (either a primitive culture or a planet that resembles earth's pre-history). No luck. Anybody? Bueller? 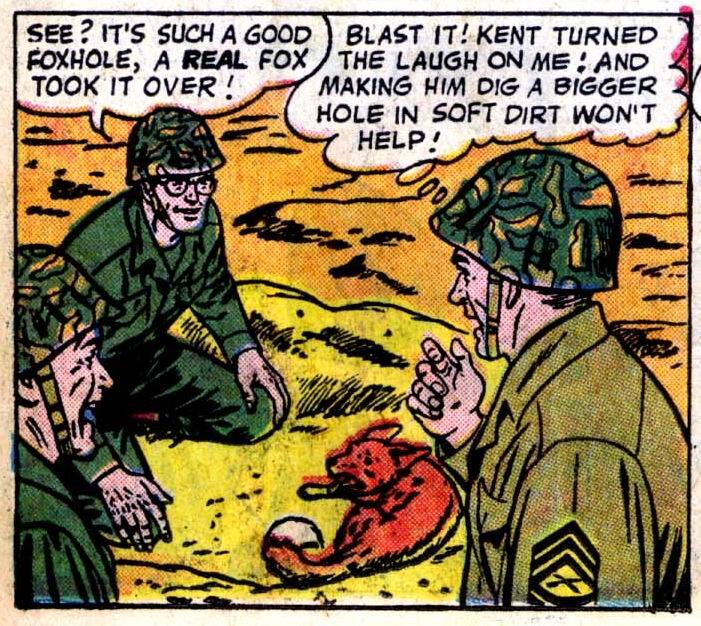 One from the mid-60s has the Fox and the Crow battling as usual. The Crow slips a letter under the door of the Fox, but his "hand" was muddy and so the Fox thinks he's gotten a "Black Hand" letter. I remember it because I asked my dad what a Black Hand letter was and was astonished that he didn't know (Dad was my Wikipedia). 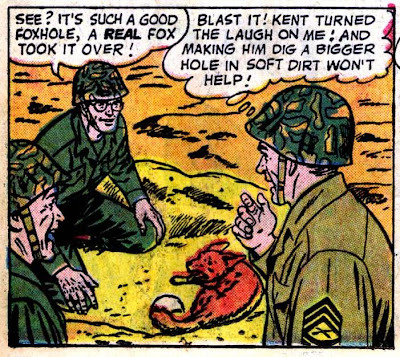 I've picked up dozens of Fox & Crow issues over the years and never found that story; I've even purchased the (shudder) Stanley and His Monster issues at the end of that run. 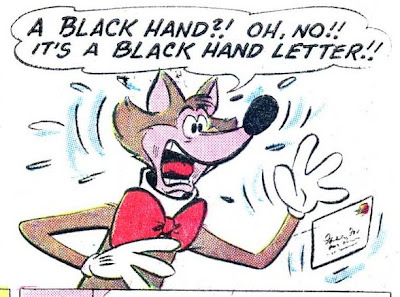 Typical Black Hand tactics involved sending a letter to a victim threatening bodily harm, kidnapping, arson, or murder. The letter demanded a specified amount of money to be delivered to a specific place. It was decorated with threatening symbols like a smoking gun or hangman's noose and signed with a hand imprinted in black ink; hence the Sicilian name 'La Mano Nera (The Black Hand) which was readily adopted by the American press as "The Black Hand Society". The other is a Baby Huey story from the early 60s where Papa is looking for help with his crossword. He needs a 16-letter word for "a ringing in the ears" and Baby Huey promptly replies "tintinnabulation". 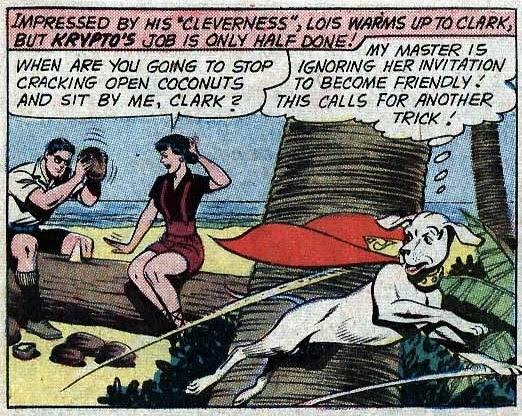 Honestly, I don’t know why so many people talk up the Superman/Lois relationship as some kind of great romance, when most of the time he treats her as at best a pain in the neck and at worst some kind of crazed stalker. And given the details of that story, it's hard to argue that is an unfair assessment of their relationship. But the arrival of all those dogs on the scene ruins the moment, and Krypto gives up on getting Superman to marry Lois. He's so peeved, in fact, that he decides to become Lois' pet. Which doesn't work out so well for her, as a cop issues her a citation because he doesn't have a license. 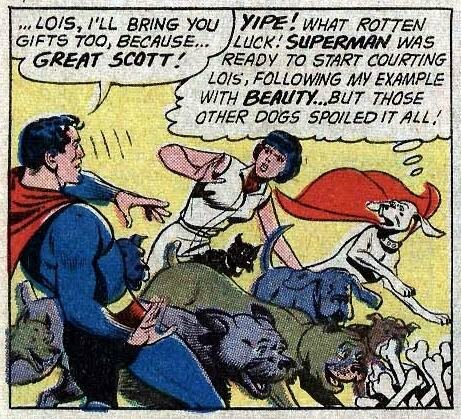 Comments: This story is played strictly for laughs, and it actually delivers, partly because of Superman's rather ridiculous behavior in a) falling for Krypto's romantic cues and b) promptly losing interest in proposing to Lois the minute something unexpected happens. 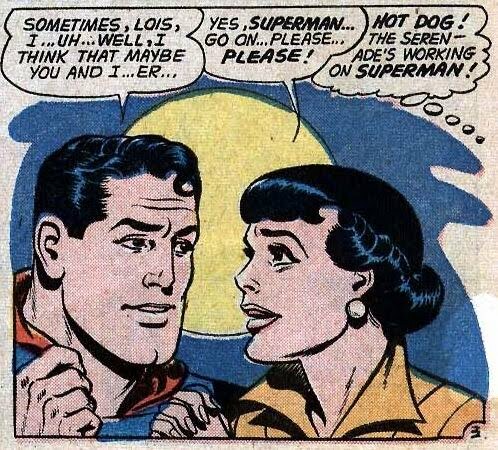 Exit question: I rather enjoy the snark in Nightwing's post about Superman and Lois. However, I usually grade these stories myself on the curve, recognizing that they were written for kids. Would you like to see a little more bite to my posts, or should I stick to poking fun when appropriate but gently? 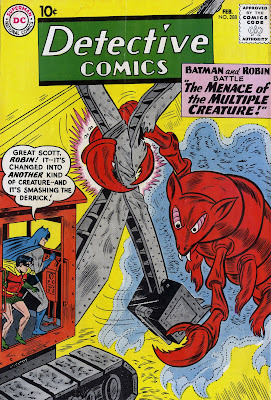 On the most obvious level, this issue is part and parcel of the horrific "monster of the month" era in Detective Comics that characterized a good part of Jack Schiff's tenure as editor of the Batman family of magazines. And make no mistake about it, that's the primary (and exceedingly silly) plot. So by this point in reading the story, I'm already yawning at the transparent absurdity. But then something interesting happens. 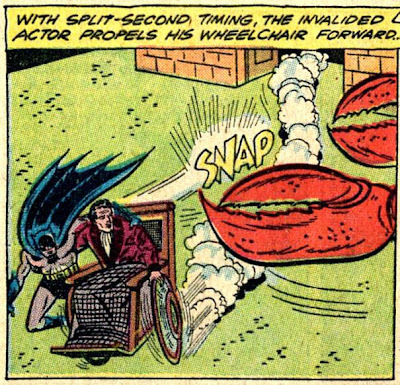 The creature heads towards the house of an old actor who's become wheelchair-bound. Batman moves to help him, while sending Robin to the town to get help. There are quite a few Batman and Robin tales from the Golden Age that follow this pattern, and they are among the classics of that era. While the stale art and the monster focus prevent this story from reaching those heights, the subplots did make it quite a bit more entertaining than I expected. The Roy Raymond story (one of the last in that long-running series) sees Roy solve the case of an heiress who has been cursed with the gaze of Medusa, causing anyone she glances at to be turned to stone. Of course, it's all a plot by a guardian to steal her inheritance. 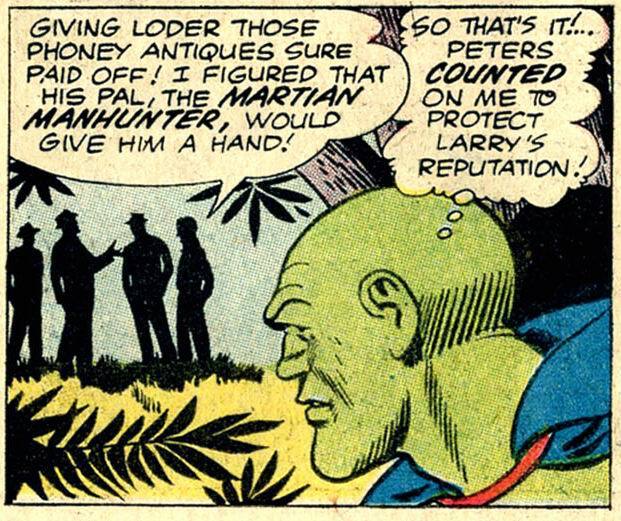 So the Martian Manhunter makes sure that the final invention works in such a way that the crooks are caught by Larry. The reward money ensures that Loder will have enough funds to pay back all his investors, who presumably reinvested the funds with him in a bagful of magic beans. 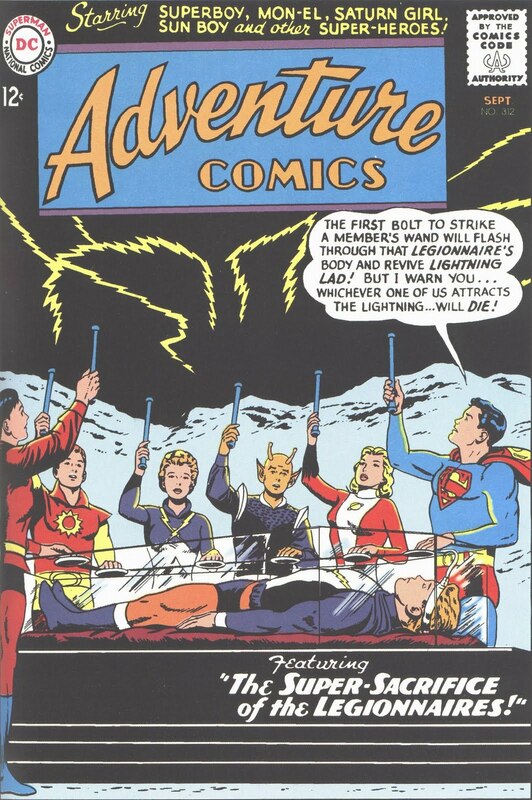 Up till this point, DC's superheroes had all pretty much relished their superpowers. And why not? Who wouldn't want to be able to zoom at super speed, or have a ring that obeys your every command, or shrink down to the size of an atom... provided, of course, that you could also be normal whenever desired. 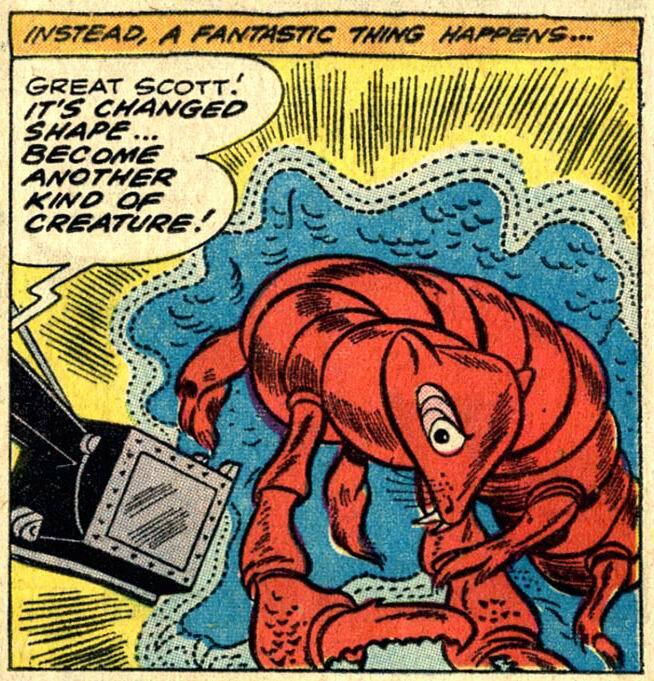 Ben Grimm, aka the Thing from the Fantastic Four, changed all that. While he had extraordinary strength, his powers came with a curse: he looked like a pile of orange rocks 24-7. Granted, it's been done to death since, but in the early 1960s this was pretty revolutionary stuff. 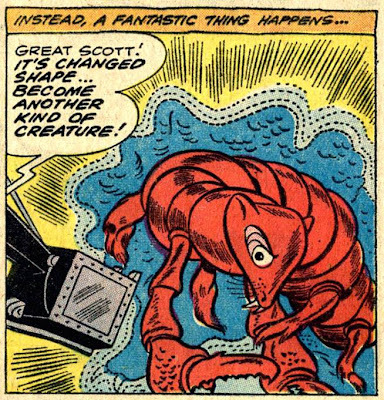 When the Thing was followed up by characters like the Hulk, Spiderman and the X-Men, it was clear that Marvel was onto something. 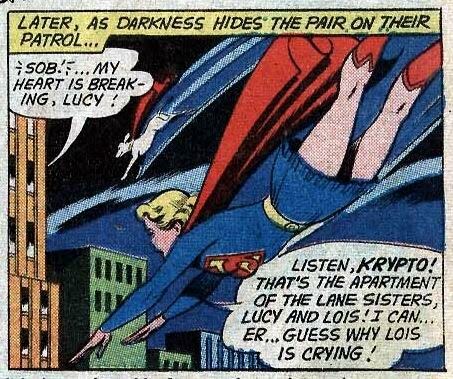 Comics fans liked heroes with permanent problems, not just the temporary annoyance of a Mr Mxyzptlk or a brush with Red Kryptonite. 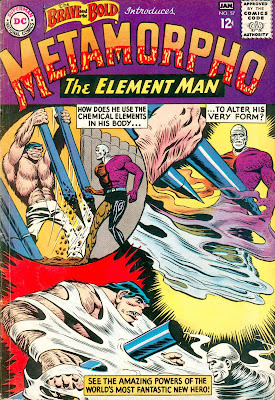 DC obviously took note and responded with Metamorpho. Rex Mason was a world-famous adventurer who traveled the globe. His employer was Simon Stagg, a wealthy, but unscrupulous tyrant, who also had a gorgeous daughter named Sapphire. Rex and Sapphire were engaged, much to the dismay of Stagg's brutish assistant, Java, an unfrozen caveman who was smitten with the young woman himself. He's still sealed inside the pyramid, but "a strange thought occurs to his confused brain" and he turns gaseous, seeping through the cracks to the outside. He and Stagg reach an uneasy truce. Stagg will try to help him get back to his normal state, and Rex will not destroy his castle. There follows a couple pages where Stagg experiments on Metamorpho, which functions mostly to define his powers. He's virtually invulnerable (except for that Orb of Ra) and he can change into almost any element found in the human body. She suggests that he use his powers for good until he can be changed back. Meanwhile, Daddy has hidden the orb in a shark tank he conveniently keeps in another part of the castle. 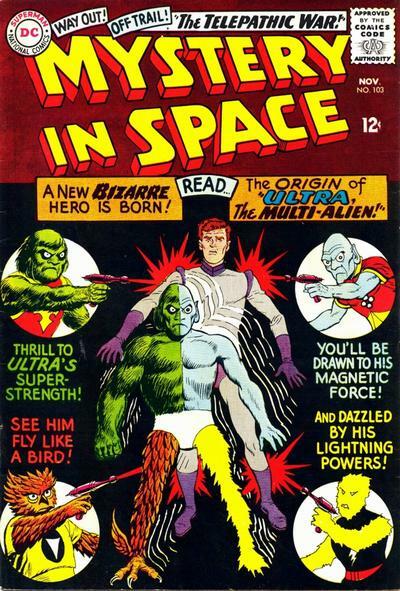 There was at least one significant difference between Metamorpho and the Thing. While both were appalled at their freaky-freak McAlien freak appearance, Ben was capable of being irascible even about other things, while Rex remained pretty much happy-go-lucky except about his appearance. It turns out that Superboy had whispered to his parents to praise Mighto and give him the music box. He had realized that the reason Mighto had done some things--like breaking that childhood trumpet and destroying a record player--was because he couldn't stand music. 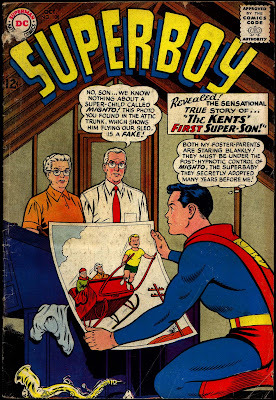 Superboy destroys Experiment X and returns Mighto to his home planet, where he's imprisoned with his parents in a cell that has ultrasonic music playing to keep his powers at bay. 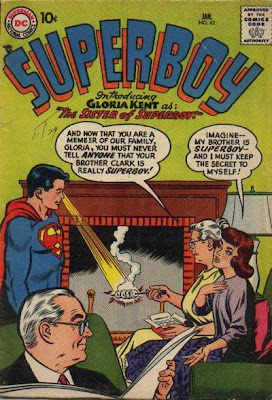 Comments: The story seems to have been constructed backwards, from the concept of the Kents having an earlier super-son to the actual plot. 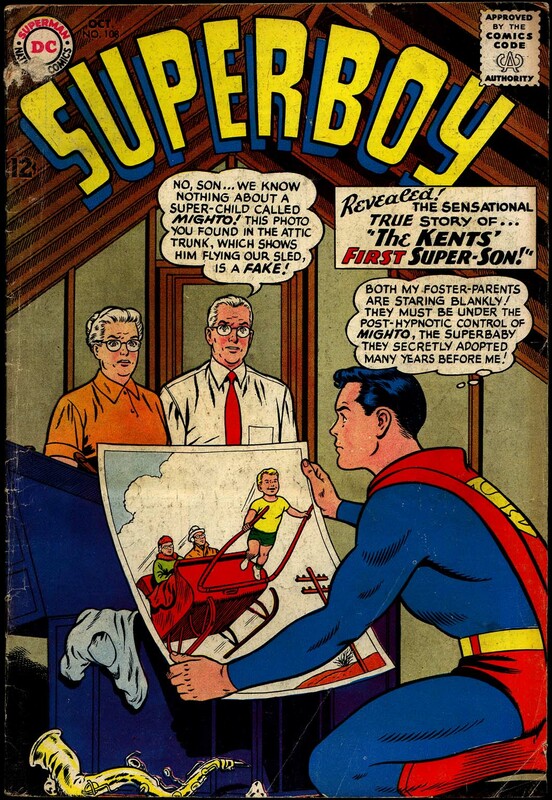 Hence things like the hypnotic suggestion that the Kents forget Mighto, and the subsequent amnesia affecting the boy. It never is really explained why he possessed such a precocious intellect other than the obvious: that it was required by the plot. So the hero goes back in time to find out why he had appeared in the distant past. Simple, it's because he went back in time to find out why he had appeared in the distant past. 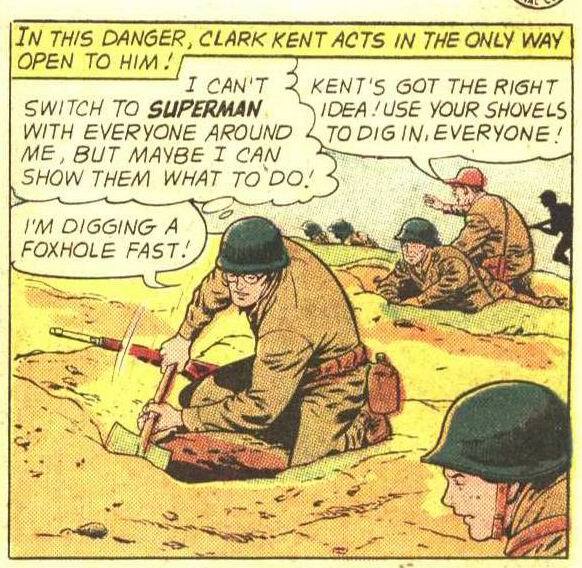 Yes, of course the bullets would flatten and form an image of Superboy, complete to the S on his chest. Comments: God-awful. There's an enormous plot hole. Superboy reasons that it's okay for him to leave since history shows that Jonas and Maria lived long and prospered. Um, in that case, couldn't Superboy have just left when accused of being a sorceror? At the end, Bald Pate gets away with his crimes. About the only redeeming feature of the story is the information on the Kent family tree.